Transgenic cotton expressing the genes for the production of protoxin of the bacterium Bacillus thuringiensis (Bt) is used to control lepidopterous pests. Among the most successful applications is for control pink bollworm (Pectinophora gossypiella Saunders (i.e. PBW)) in irrigated cotton of the southwestern United States. A major threat to this technology is the development of resistance commonly assumed recessive, autosomal and controlled by a single diallelic gene. PBDMs of Bt Cotton and 10 of its major pests were developed. We used the model to examine the population dynamics and resistance development in pink bollworm and other pest species as modified by weather and spatial and temporal refuges. The economics of Bt cotton for control of PBW in southern California is put in the context of the historical overuse of pesticides and the alternative short season cotton technology. The analysis posits that in the short run, Bt cotton may be risk reducing and economic, but in the longer term it may be risk increasing. A similar model for transgenic Bt cotton expressing one or two toxin of the bacterium Bacillus thuringiensis Berliner (Bt) and 10 of its pests as affected by generalist natural enemies was developed. The goal of the model was to assess factors favoring the development of resistance in pest species. Among the pest included in the model are the pink bollworm (a primary pest of cotton), and several secondary pests of the family Noctuidae (tobacco budworm, bollworm, fall armyworm, beet armyworm, cabbage looper, soybean looper) as well as a plant bug, boll weevil and whitefly. The pests have widely varying tolerance to the toxin (see cited papers). Gutierrez, A. P and S. Ponsard, 2006. Physiologically based model of Bt cotton-pest interactions: I. Pink bollworm: resistance, refuges and risk. Ecological Modelling 191:346-359. Gutierrez, A. P., J.J. Adamcyzk Jr. and S. Ponsard. 2006. A Physiologically based model of Bt cotton-pest interactions: II. 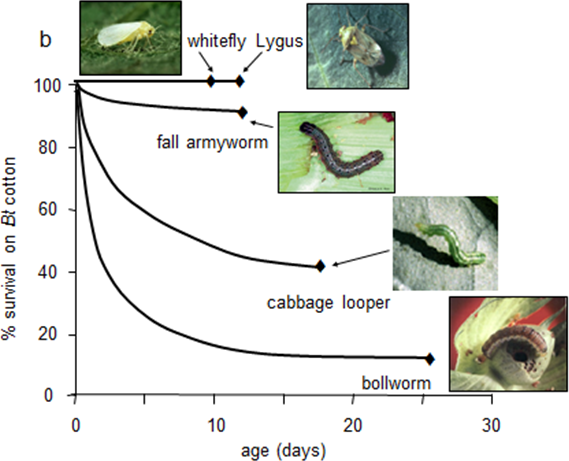 bollworm-defoliator-natural enemy interactions. Ecological Modelling 191: 360-382. Pemsl, D., Gutierrez, A.P., Waibel, H. (2007). The Economics of Biotechnology under Ecosystems Disruption. Ecological Economics. 66:177-183. Pemsl, D., H. Waibel and A.P. Gutierrez. 2005. Why do some Bt-cotton farmers in China continue to use high levels of pesticides? International J. Agric. Sustainabily 3:44-56. Gutierrez, A. P., W. J. Dos Santos, A. Villacorta, M. A. Pizzamiglio, C. K. Ellis, L. H. Carvalho and N. D. Stone. 1991. Modelling the interaction of cotton and the cotton bolll weevil. I. A comparison of growth and development of cotton varieties. J. Appl. Ecol. 28: 371-397. Gutierrez, A. P., W. J. Dos Santos, M. A. Pizzamiglio, A. M. Villacorta, C. K. Ellis, C.A.P. Fernandes and I. Tutida. 1991. Modelling the interaction of cotton and the cotton boll weevil. II. Boll weevil (Anthonomus grandis) in Brazil. J. Appl. Ecol. 28: 398-418. Pizzamiglio, M. A., A. P. Gutierrez, W. J. dos Santos, K. D. Gallagher, W. S. Oliveira and Z. V. Fujita, 1989 Phenological patterns and sampling decision rules for arthropods in cotton fields in Parana, Brazil: before boll-weevil. PAB 24: 337-345. Santos, W. J. dos, A. P. Gutierrez and M. A. Pizzamiglio. 1989 Evaluating the economic damage caused by the cotton stem borer Eutinobothrus brasiliensis (Hambleton 1937) in cotton in southern Brasil. PAB 24: 297-305. Stone, N. D., A. P. Gutierrez, W. M. Getz, and R. Norgaard. 1986 III. 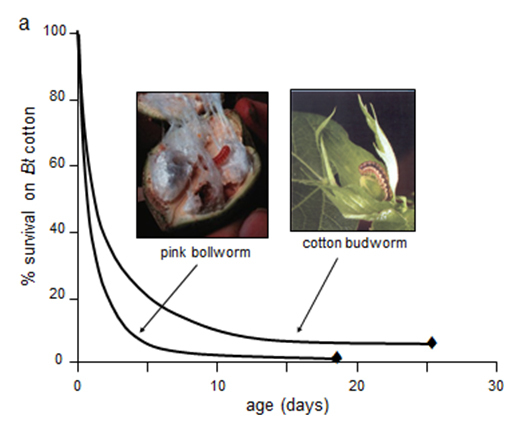 Strategies for pink bollworm control in southwestern desert cotton: An economic simulation study. Hilgardia 54:42-56. Gutierrez, A. P., M. A. Pizzamiglio, W. J. Dos Santos, R. Tennyson and A. M.Villacorta. 1984. A general distributed delay time varying life table plant population model: cotton (Gossypium hirsutum L.) growth and development as an example. Ecol. Modelling 26: 231-249. Gutierrez, A. P., J. E. Devay, G. S. Pullman and G. E. Friebertshauser. 1982. A model of verticillium wilt in relation to cotton growth and development. Phytopath. 73: 89-95. 1983.